When a large commercial truck collides with a much smaller passenger vehicle, it is very likely to result in grave injuries or death for those in the smaller vehicle. Those who have experienced an accident with a large commercial truck were likely seriously injured and perhaps emotionally traumatized as well. Having an experienced truck accident attorney by your side following such a traumatic event can make a huge difference in the outcome of the accident. The attorneys at Coxwell & Associates have a long history of helping those injured in truck accidents and will work hard to ensure victims of truck accidents receive fair compensation for their injuries. 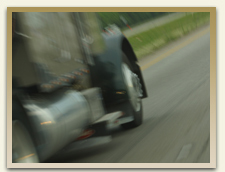 We understand the dynamics of a truck accident and know how to pinpoint the negligent party or parties. The economy of the United States depends heavily on the trucking industry—nearly 70 percent of all freight transported annually travels by truck. Nearly 90 percent of large commercial truck accidents are either caused, or made worse by human error, whether by the truck driver or the other driver. Truck driver fatigue is responsible for at least a third of all commercial truck accidents (although some statistics place that number as high as 87 percent). In 2010, there were 1.1 fatal crashes per 100 million truck-miles. In 2010, 3,413 people died as a result of a large truck accident. While 14 percent of those who died in a large truck accident were occupants of the large truck, 72 percent of those who died were occupants of a passenger vehicle and the remaining 14 percent of those who died were pedestrians, motorcyclists or bicyclists. While large commercial trucks account for 4 percent of the registered vehicles on the highways, they disproportionately account for 9 percent of motor vehicle crash deaths. About 61 percent of fatalities occurred on major roads other than interstates. Head-on collisions account for 45 percent of a truck/passenger vehicle accidents. Nine percent of crashes involving a large commercial truck occur while the truck is negotiating a curve. In seven percent of truck/passenger vehicle fatal crashes, either the truck or the passenger vehicle was stopped in a traffic lane. The overwhelming percentage of both fatal (84%) and non-fatal (88%) crashes involving a large commercial truck occurred on a weekday. Truck driver making improper maneuvers. The truck accident lawyers at Coxwell & Associates understand that the damages caused by large commercial trucks can be severe and life-altering. We want to help you make it through this difficult time, and be able to look forward to your life once more. If you or a loved one has been injured or killed in a truck accident, contact Coxwell & Associates today for a free consultation.